Combining the skin rejuvenating benefits of vitamin A with a weightless, non-chalky sun filter is a skin care revelation, which is why we’re so besotted by Verso’s new-and-improved approach to retinol. Barely detectable on the skin – the formula sinks in without a trace – this innovative lotion works to kick-start sluggish cells, encouraging collagen synthesis to fortify skin’s fabric, whilst diminishing the appearance of wrinkles – even deep-set expression lines. The addition of vitamin B3 then helps to brighten your complexion, while sun filters prevent future skin degradation caused by everyday UV exposure. 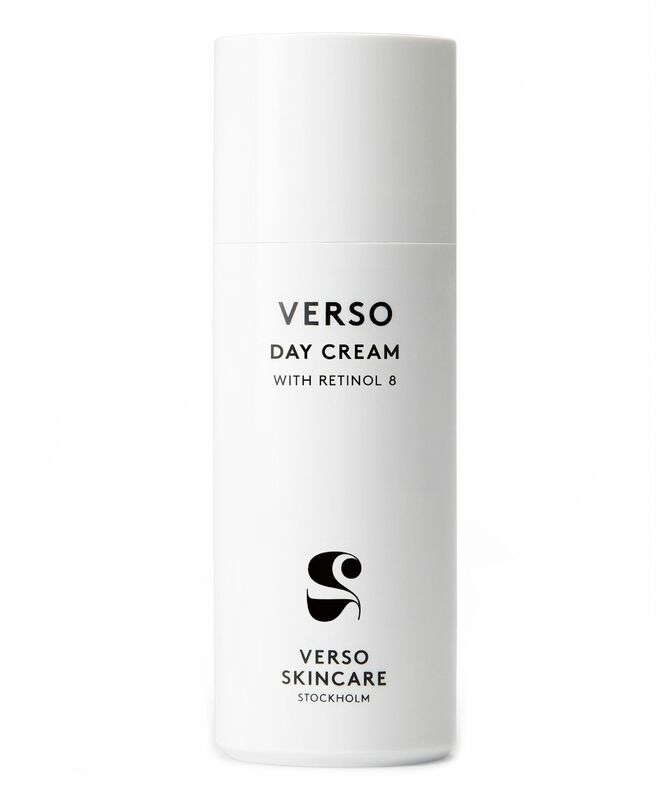 The ultimate daily hydrator, Verso’s Day Cream keeps skin looking fresh and luminous from morning ‘til night – smoothing creases, boosting radiance, brightening imperfections and providing protection from sun damage, without the tell-tale film left behind by so many skin care/sun care hybrids. This is serious age-defying stuff; Verso are swiftly redefining retinol, with their patented ‘Retinol 8 Complex’ – a unique vitamin A derivative (a more stable form of vitamin A, with eight times the potency of typical retinol in the same dosage), together with polyphenol extracts – that works to smooth the appearance of wrinkles, strengthen the skin barrier, reduce pigmentation and supply the skin with more much-needed energy and oxygen to refine and illuminate without irritating. Not suitable for pregnant ladies. Aqua, Ethylhexyl Methoxycinnamate, Niacinamide, Butylene Glycol, C12-15 Alkyl Benzoate, Diethylamino Hydroxybenzoyl Hexyl Benzoate, Diethylhexyl Carbonate, Heptyl Undecylenate, Glycerin, Butyrospermum Parkii Oil, Cetearyl Olivate, Aluminum Starch Octenylsuccinate, Sorbitan Olivate, Ethylhexyl Triazone, Jojoba Esters, Canola Oil, Retinyl Retinoate, Hydroxyethyl Acrylate/Sodium Acryloyldimethyl Taurate Copolymer, Tetrahydrodiferuloylmethane, Tetrahydropiperine, Tocopheryl Acetate, Curcuma Longa Root Extract, Sodium Hyaluronate, Tocopherol, Cetyl Palmitate, Sorbitan Palmitate, Citric Acid, Phenoxyethanol, Caprylyl Glycol, Sodium Hydroxide, Parfum. I've been using this for since March. Skin looks noticeably different. My make up application is beautiful, skin looks noticeably clear. I have also noticed that my skin feels soft and plump. I feel good having it on and have been using this regularly. Happy so far, who knows what the benefits are long term I've used this cream for a while and I will use until used. This is the best cream I have ever tried, I would recommend to everyone, It lasts for about 6 months as well. Great value! With skin care I usually take four weeks to make up my mind, with Verso it took four days – and this wasn’t just because I’m a sucker for great packaging. This moisturiser is my star product from the range. It keeps my face looking fresh all day while pluming out the ageing blips that mar the surface of my skin; my favourite aspect of this moisturiser is that it contains SPF 20 without that annoying residue that SPF always brings to day creams. I am completely sold, its a modern range with impressive technology, that ticked every skin care box I have. Wow! NB 6 months after this review: Verso have since taken their brand into the US, who have different rules around SPF and rather than tamper with the winning formula, they just took the SPF20 claim off their packaging. I so wanted this line to work for me but it was a catastrophe....I had the worst allergic reaction ever, had to go to the doctor and treat it with cortison so bad it was. It might only be me, but I'll steer clear of this brand in the future. Gutted. A promising product, but not for me. Reading the blurb and checking through the ingredients list, this is a really great product. Retinol is one of the few genuinely scientifically-proven ingredients in the fight against signs of aging. I desperately, desperately wanted this to work for me. Unfortunately, it just does not agree with my skin and caused breaking out as soon as I started using it. One of those ingredients in there is obviously not my friend. Please don't let my experience put you off trying it, however. A product such as this, containing Retinol, is likely to make a real difference to your skin - although you should give it time to work and do its job. I really wish that it suited my skin, because it's exactly the type of product that I'm looking for. Instead, I have fallen in love with Sunday Riley's Good Genes Treatment, which doesn't cause me any problems with breakouts and makes my skin look amazing. I still think Verso have made an excellent product, and I am extremely tempted to try the eye version, in the hope that it won't cause me the same problems. Fingers crossed!